The Wiggle journey began in 1995 when founder Mitch Dall bought a bicycle shop called Butler Cycles in Portsmouth. Quickly transitioning to the great opportunities that the internet offered, Mitch changed its name to Wiggle and quickly began expanding its range of products.The comprehensive collection of gear, clothing and accessories provided by Wiggle is enormous, and each product range is tested by Wiggle’s team of experts to ensure only the best is placed on the website. From the beginner runner, to the professional cyclist, to the dedicated swimmer, you can find the best goods to improve your performance or make your experience more enjoyable. Wiggle is proud to offer some of the best known brands such as Berghaus, Salomon and North Face, and also some others that you may not be familiar with. When browsing the Wiggle website it should be apparent that its employees are all dedicated, knowledgeable and above all enthusiasts! Check out the Wiggle blog for advice or even give a member of customer service a quick ring for a chat! How do I use my Wiggle discount code? Sign up now to receive the Wiggle Newsletter, with special discounts, deals and new product lines! Is Wiggle part of the Cycle Scheme? Yes it is. Click here to find out more. Yes, there is a Wiggle Price Match promise and it agrees to refund the difference within seven days. Will this Wiggle product fit me? Look at the size guides provided on the product page, which is in the bar below the "customers also bought" pane. For further assistance contact a Wiggle customer service member via email. Delivery to Ireland is free if the order is over £24.56. Orders costing less than this vary in price. Click here to find out more. Email: Click here to email Wiggle. You can also write to Wiggle at this address. Wiggle customers have 365 days from date of delivery to return their orders if unwanted. Are you a complete action man (or action woman) capable of feats of strength, skill and endurance beyond your fellow humans? Use our Wiggle discount code and equip yourself for the rigours of triathlon, the outdoors and the gym at prices that you can afford. With an enormous range of stock and only the finest products, you can get on your bike and win whatever race or personal goal you have set yourself. 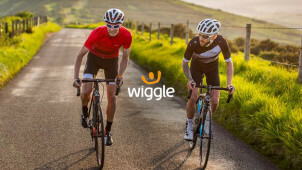 Besides offering all the equipment and clothes that you need to succeed at cycling, running and swimming, Wiggle is proud to help its customers get involved with specialist events. Why not test your training with Wiggle Super Series Hawker Hurricane Sportive? Why not compete against the best in the country in the Wiggle Super Series Purbeck Hill-a-Saurus? These events are just some of the races on offer at Wiggle. Going on a daily run is superb for fitness, enjoyment and your general mental well being, but it can be a struggle sometimes with Britain's miserable weather and cold mornings. Use our Wiggle promo code and pick from rigorously tested products and clothing that improves your performance and keeps you fighting fit for your daily exercise. From base layers & thermals, to off-road shoes, to lights & reflectives - Wiggle is the place to go!